Glass is one of the world’s most complex, high-performance materials: specialty glass can be engineered to suit miniature, hyper-precise optics just as readily as it can be manufactured for bullet and fire-proof windows and walls. Glass can withstand explosions, extreme environments, and some of the world’s most aggressive and corrosive chemical materials. Glass formulations can be specially cut and crafted to order then treated to suit all of these unique situations. However, glass can also be molded to create unique shaping for lenses, appliances, specialty lighting, and much more. One of the most time-consuming and expensive types of glass manufacturing, custom glass molding starts with standard flat glass or glass blanks and physically presses, spins, or melts the glass into a new shape. Because of the intense engineering and precision process of glass molding, the finished molded glass offers exact custom curved shapes with high quality surfaces. Because it can be used for such precise craft, glass molding is often used for lighting, lenses, art/architectural glass, and optical applications where precision curvature is critical to performance, especially at a large scale. In its most essential industrial form, glass comes in sheets. Flat glass, also commonly called plate glass or sheet glass, is factory crafted in furnaces around the world. Starting with sand, the manufacturing process melts down a glass compound’s mix of materials into a liquid state before spreading it into a sheet. These sheets can then be tempered, treated, and coated for specialty applications, or infused with strengthening agents and even decorative textures and colors. Bullet or explosion proof glass, art glass panels and signage, glass conference tables, and store display windows all begin with plate glass. Flat glass is drilled, ground, polished, cut, lapped, and machined to create complex tools and parts of all shapes and sizes. It’s one of the most critical materials manipulated for common building and construction, and also provides key performance for medicine, industrial applications, chemical processing, photonics, and even military grade jobs. The difference between flat and molded glass seems relatively straightforward: one is flat, while the other is curved. However, flat glass can be machined into curved shapes without the complete molding process: grinding, polishing, and custom machining can all create depth in what was once a simple flat glass plate. Molded glass press systems are ideal for high-volume production and fine finished surface qualities for coating. Flat glass finishing is best suited for precision lenses and optics. Flat glass is the most common industrial choice for windows, doors, furnishings, walls, and large scale applications. It can be readily cut and finished to fit any application. As a worldwide leader in glass fabrication, the Swift Glass team is ready to help you find the best design and glass style to suit your next project. Our specialists offer CNC machining, ultra-high pressure cold cutting, drilling, polishing, printing, and many more service options. We work with flat glass to create some of the most precise glass components available, serving photonics, specialty optics, and strict medical specifications. 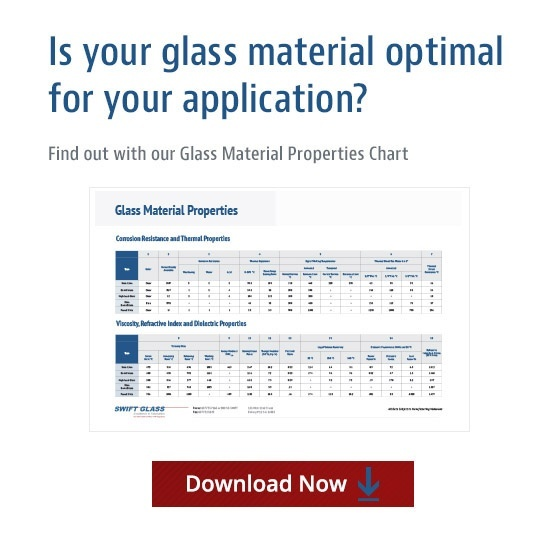 To get started with your next project, reach out to one of our specialists or check out our free eBook — 5 Important Questions to Ask your Glass Manufacturer — today!